A hurricane is a tropical storm with winds that have reached a constant speed of 74 miles per hour or more. Hurricane winds blow in a large spiral around a relative calm center known as the "eye." The "eye" is generally 20 to 30 miles wide, and the storm may extend outward 400 miles. As a hurricane approaches, the skies will begin to darken and winds will grow in strength. As a hurricane nears land, it can bring torrential rains, high winds, and storm surges. 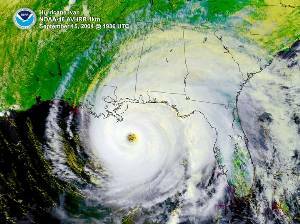 A single hurricane can last for more than 2 weeks over open waters and can run a path across the entire length of the eastern seaboard. August and September are peak months during the hurricane season that lasts from June 1 through November 30.